Conmark Systems Inc. continues to have great success with their NIR based liquor analyzers, both on-line and bench top models. There are now over 27 systems running succesfully in N.A. 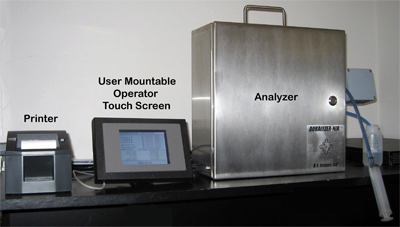 A Bench Top Analyzer is also available for the lab. The Duralyzer-NIR Bench Top Liquor Analyzer is a perfect solution for Pulp Mills. It has been designed to overcome all of the issues associated with manual liquor testing, providing fast, reliable, and accurate results with minimal operator involvement. The DURALYZER-NIR bench top analyzer provides the results of the standard ABC titration test, providing effective alkali (EA), active alkali (AA), total titrateable alkali (TTA) and Na2SO4 measurements for white and green liquors. In addition, total dissolved solids (TDS) and total dissolved deadload (TDD) measurements are also provided. For black liquor, residual effective alkali (REA), residual active alkali (RAA), total dissolved organics (TDO) and black liquor TDS measurements are provided.